Although the Sun Buggy Desert Racers are easy to drive just like an automatic car, we require that those Driving a Sun Buggy be either 16 with a valid drivers license, or 15 with a driving permit AND a parent in the buggy. Guests must be sober and not under the influence of any drugs or alcohol at the time of the experience. Guests must obey range supervisor instructions at all times. Guests must be 18 years of age or older and provide valid photo ID. What’s standing in between you and some serious fun? Maybe it’s the simple fact that you don’t have 15,000 acres of open desert to plow through. That’s about to change. 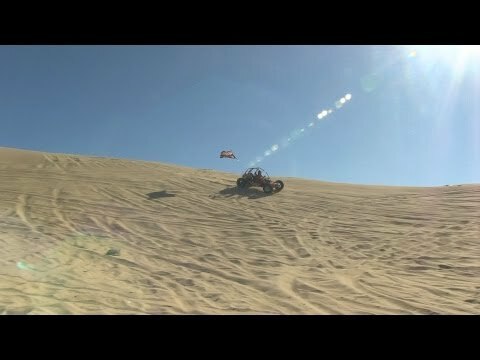 Plan for a Sun Buggy Mini Baja Chase. Suit up and head out on a serious off-road adventure. “Suit up” doesn’t mean putting on any suit, it means a full face helmet and a 4-point harness. You won’t be a passenger, but you’ll be behind the wheel chasing a Sun Buggy dunie expert. As you're trying to keep up with the expert, you'll encounter the rough desert terrain. You’ll take the buggy through the dunes, where you’ll get a spectacular view of the Strip, you'll skirt across the gravel, over the hills, into the valleys, and through washed out creek beds. Keep in mind these trails run every which way, so keep your senses alter at every turn. Never have you had a more exhilarating 30 minutes. The buggy isn’t a challenge to drive either just remember the gas and the brake, that’s all there is to it. Again, driving is the easy part, it’s the landscape that’ll give you thrills. The buggies are fast and aggressive, so if that’s your style, then you’re in for the ride of your life. Cancellation Policy: If your plans change and you're not able to make a scheduled time, we will allow you to reschedule your adventure or issue a gift certificate for your adventure once you are ready to pick a date provide you give us at least 24 hours of advanced notice. Within 24 hours of your reserved time there are no reschedules or gift certificates issued. Under no circumstances are refunds for reserved vehicles issued, so please make sure you either make your reserved time or reschedule over 24 hours out to when you can make your reservation.